HAMAR TWP, Pa. — In an All-Star Game that features the best and most talented players at a particular level of hockey, it becomes harder for one player to stand out than in a typical hockey game. 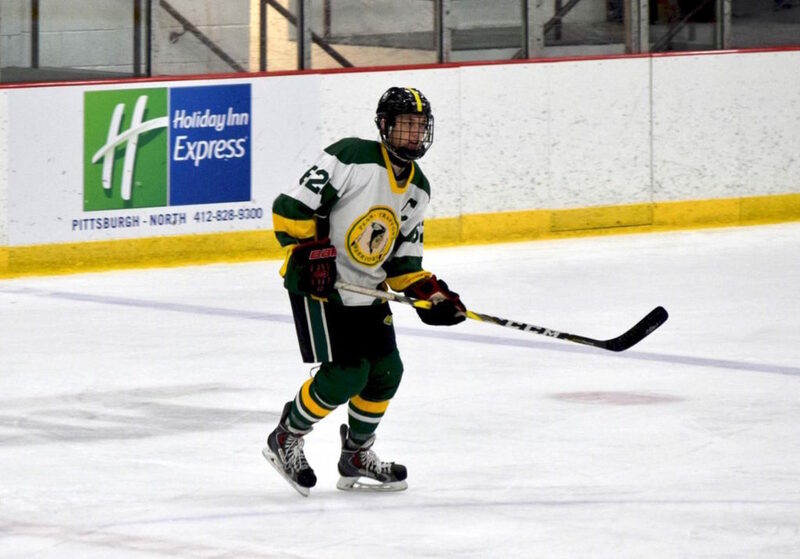 But Penn-Trafford senior forward Nate Mickey did just that and shined the brightest in the PIHL Double-A All-Star Game on Sunday at Alpha Ice Complex. Mickey scored three goals and helped lead his team to a victory in the exhibition showcase. Scoring goals has not been a problem for Mickey this season. He leads his team with 23 goals in 14 games. Mickey ranks second in AA in goals and third in points. It was his third hat trick this season and earlier in the year, the electrifying senior had a four-goal performance. While the success of scoring goals comes down to the individual performance, Mickey was quick to note that his success would not have come without being a team player first. Being thrown into an all-star type of atmosphere may make it hard to be a team player, due to the fact that these players are not practicing together all the time. But Mickey mentioned that he did have some chemistry built in with some of the other players from club experiences, and that made it much easier to settle into his game, and build that success with his linemates on the fly. The chemistry was easily built and the gameplay suited his best assets. Mickey is a player who brings speed and can be seen flying past defenders. Throwing the best skaters in the area together made the game faster than you would expect from a typical PIHL game. That is where Mickey thrived. The speed of the game, combined with his past chemistry was the perfect recipe for a memorable night out of the Penn-Trafford captain. The Warriors are currently 6-8, and with five games left on the schedule, they are not out of the playoff race yet. They have won their last three games, including a victory over Hempfield, the team they are chasing for the fifth and final spot in the Double-A Eastern Conference. Mickey and the Warriors will look to continue their success on Monday as they visit Hampton at Ice Connection in Valencia for a 9 p.m. faceoff.